It’s been a minute since we got onboard with Squid, but there’s been plenty of activity since then! It’s cross season and it’s also the first month of school, so Riley’s had limited time for bikes right now. But it’s done! It’s dialed! It rips! Riley likes a really responsive and flickable bike, and the Squidcross is just that: turn hard and sharp, pedal the back end around. The bike communicates what’s going on with grip better than anything we’ve tried. Riley stands by the fade+splatter fork being the best thing he’s ever done, and it’d be hard to argue. The only disappointment is that you don’t see the inside of the fork that often… It’s the design that started PDJ’s Summer 2018 splatter obsession—there are still one or two splatter caps left at the shop, and we’re taking preorders for 1x chainring paint that will fulfill in December. We love, love, love Astral wheels—handbuilt to order, serialized, White Industries hubs? Yes, please! But Riley wanted to have something a little zestier, so he did a custom build with gold W.I. CLD hubs and Wanderlust rims. It’s the same amazing wheel, just more gold-er this time. Taking care of grip and mounted tubeless (because why the hell wouldn’t you?!) are a pair of the Wet tread Vittoria Terrenos. Victoria’s cross races were mud fests from round one, and the awesome Dry and Mix treads might not be needed this year. Although the 40mm Dry was the perfect choice for the couple gravel grinders outside of Victoria, and this bike is a great gravel weapon too! 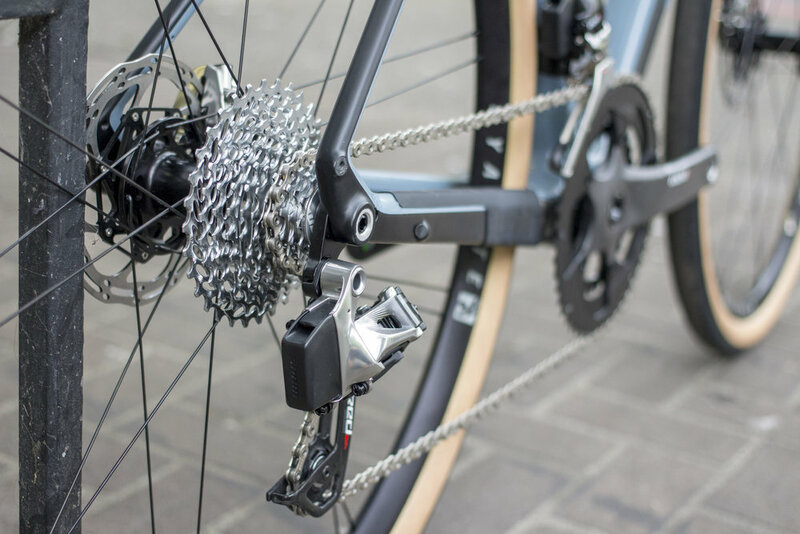 Shifting is taken care of by a Shimano Ultegra R8000 drivetrain and RS685 shifters. Brakes are Shimano Zee freeride calipers because if you have four pistons that’s cool, right? Right? Thru-axles are the purple Paragon Machine Works specials! 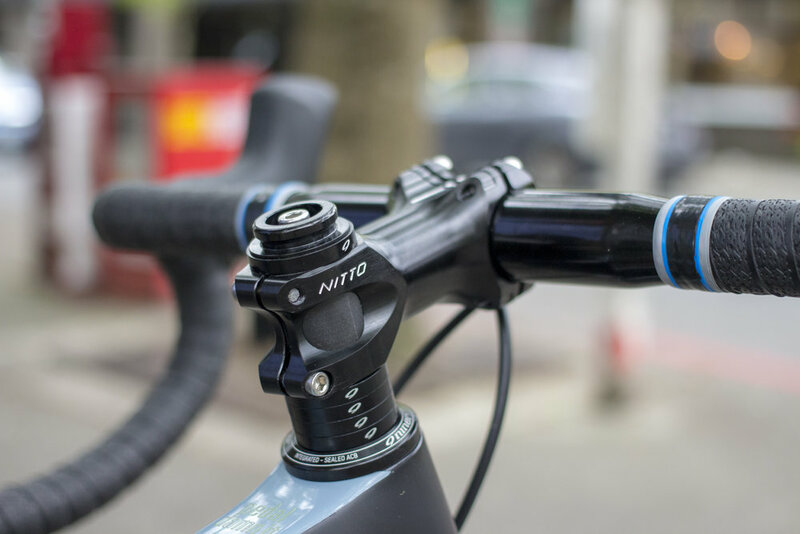 The cockpit is our increasingly ubiquitous choice: Nitto UI-25 and Soma Highway One bars. It’s just so classy. A nice blue/purple/red finish tape matches the paint fade. And if you’ve forgotten… it’s a Squid. Riley lives in Victoria, BC 2/3 of the year for school, so he needs a mountain bike that can take some abuse and can handle tech on a budget. And then handle some more tech on wet rocks. His very upgraded aluminum Jet 9 has done its job. There's not a whole lot to say here: Reverb, Minions, XT group. It's a ripper. 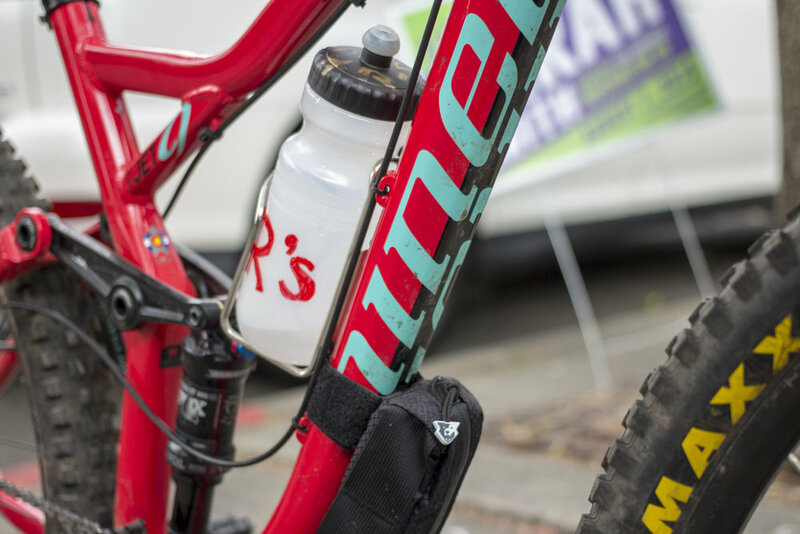 The Wolf Tooth bag mounts nicely on the downtube and holds a tool, a tube, some carbon dioxide, and trail snax. To fit a longer post in this frame, Riley slapped a Wolf Tooth ReMote Sustain on in place of the Connect-A-Majig and it works! Cable Reverb, comin' up. Not much to say on this one. This is a serious bike. Hot take: Dura-Ace 9000 is the last groupset ever that will be considered "classic." I'll see myself out. Riley made plans for a new a-bike, and so we had to figure out what to do with his a-bike from years prior. Sure, it could be sold—but where the heck is the fun in that?! 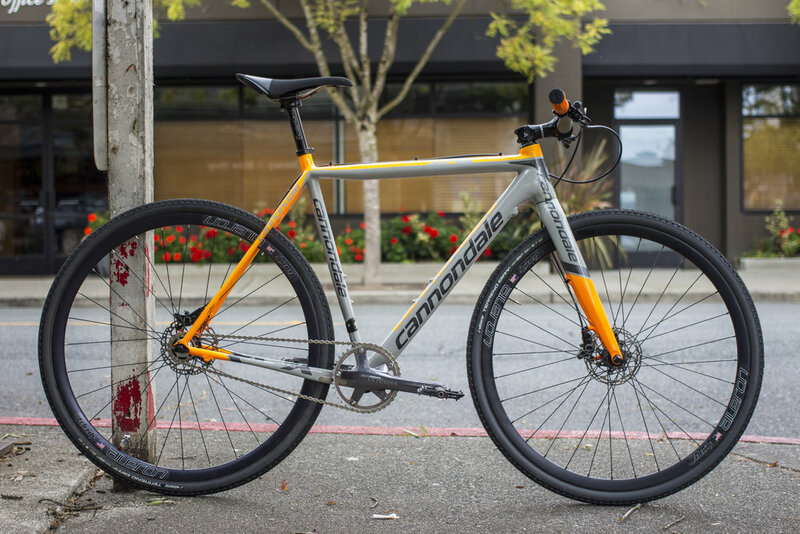 Time to do a flat-bar singlespeed like all the cool kids in British Columbia. And boy. Did it work. Affixed are a pair of 800mm Renthal Fatbars, as is traditional in Belgium. A pair of absolutely destroyed Deore brakes off of Andrew's first mountain bike deliver cantilever levels of clamping force. A schrader adapter is only acceptable when adapting a valve stem to take a delightful skull cap. Being one of Riley's bikes, it had to have a custom touch, so here's a gold top cap that's getting really chipped up. Something to make it unique. 39x17. A manly gear for PDJ's boy genius. 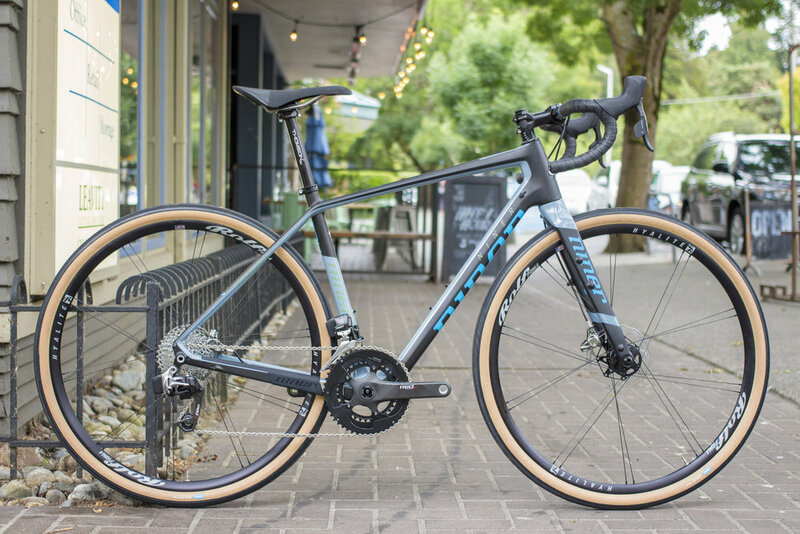 When Robert swung by and told us he wanted a bike he could enjoy pedaling up and ripping down for full day rides, we knew it had to be the Niner RKT 9. We went with an XO1 build for precise, poppy shifts, and upgraded from stock where it would make things better. Stop one was a pair of i9 Ultralights. Carbon wheels are awesome, but not quite worth it in our book. 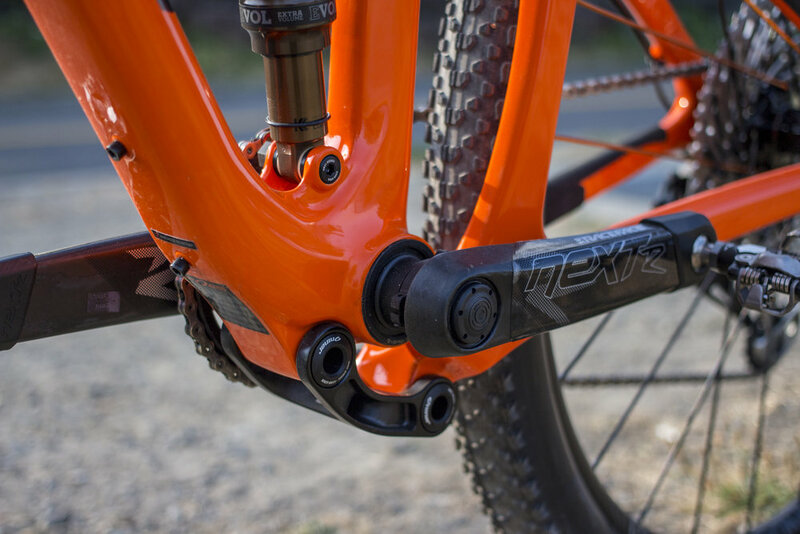 For what Robert said he wanted to do, the 3-degree engagement on a Torch hub was going to be a better improvement, and the better day-to-day experience of an aluminum rim would let the bike get out on the trails whenever it was time. And colored spokes are always good, clean fun. 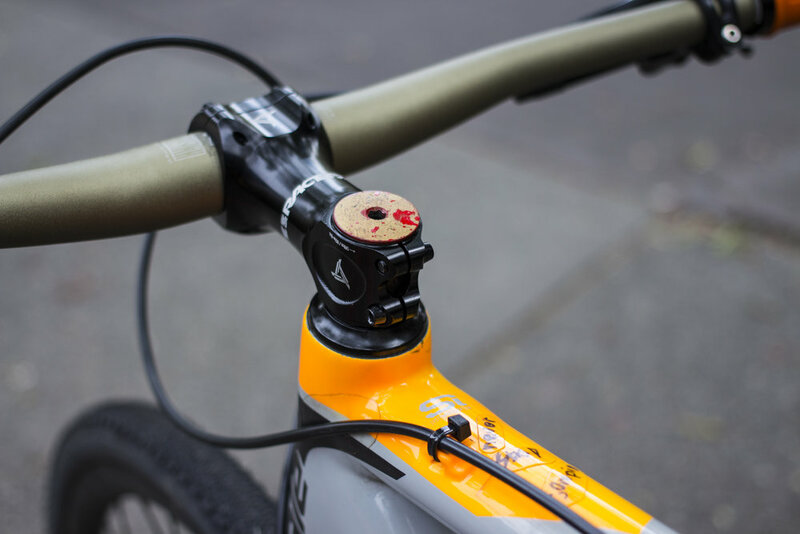 When e came to the subject of power meters, we decided that the Race Face Cinch meter's weight, simplicity, and battery life were the end of that story. Combined with a burly, but light pair of Next R crank arms, there's not much more to ask for. 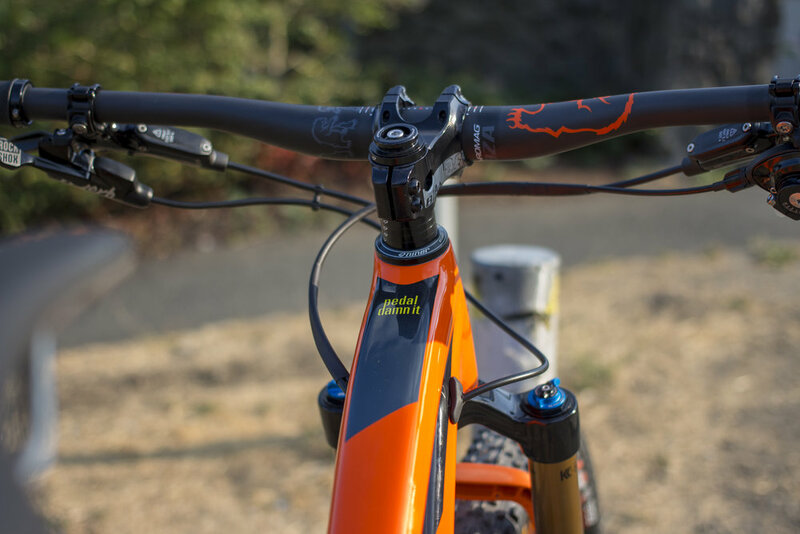 Being the dirtbag struggle up, crash down goons that we are, we spec'd a pair of 800x35.0mm Chromag BZA bars and a meaty Chromag BZA stem on there in place of the race-spec 760x31.8's. And we threw a Reverb 1X on, which Niner clearly wasn't expecting most people to do. Andrew got it done, but the effort nearly killed him. Still, despite all the burly parts we used, it still weighs 25.4 pounds! Ridiculous! Ridiculous fun! Seeing someone's excitement when they collect a bike that is perfect for what they want to do is the biggest reason we keep showing up. And that's why we love having Niner in our repertoire: these bikes are good, clean fun. 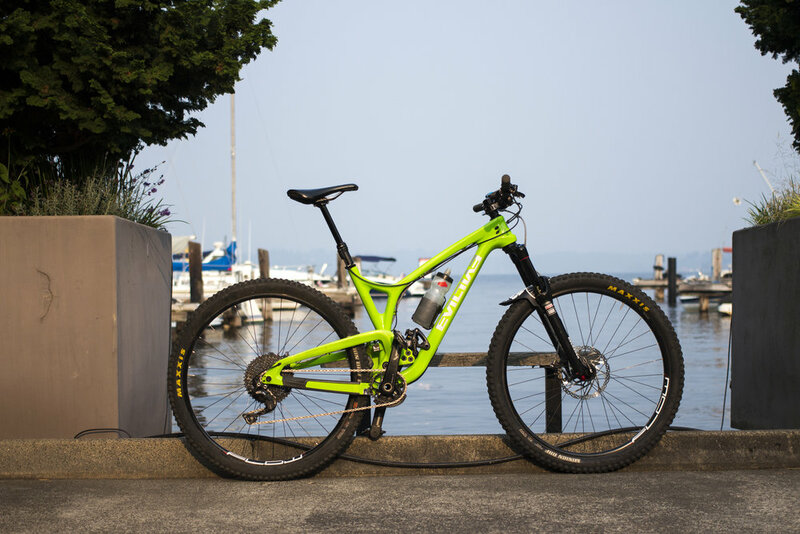 When we got to ride the new Niner Jet 9 RDO, we fell in love. This is probably the most playful but still plush trail bike on the market at the moment. 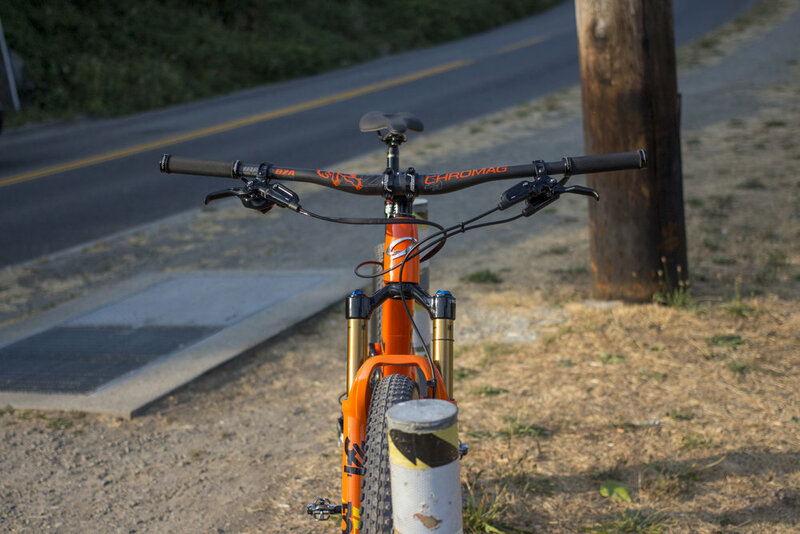 This particular build features a 140mm air spring in the fork, which ships at 120, and this makes the bike even better. 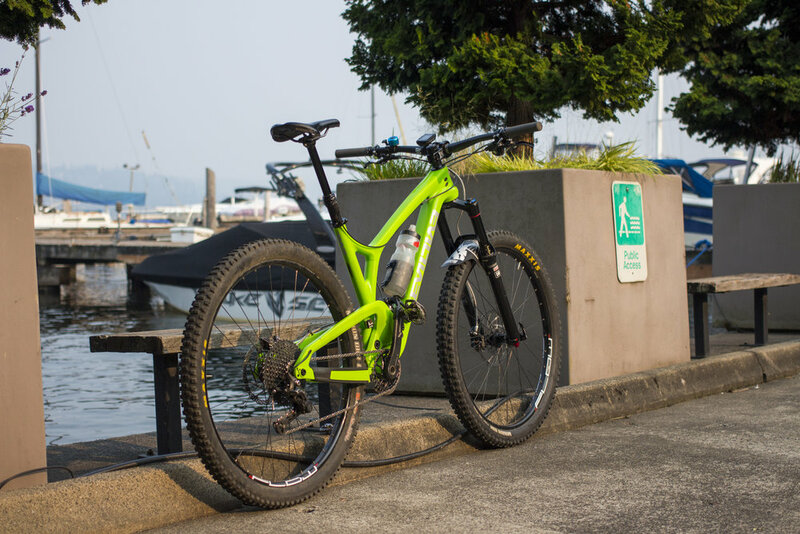 This bike is what we'd choose for our only mountain bike. Pedals pretty dang good, descends in a way that forces you to smile, jumps how you expect it to. We heatshrunk the cables to keep it as clean as it rides. And this is the bike that introduced us to the awesome OneUp Comp pedals. So we love it for that, too. Here's a sneak peak preview of the first Squid that we built. We're happy to have the good folks in Sacramento do a paintjob for you, or for you to DIYFS, but Riley is also very happy to design and paint for you. Like, really happy. Look at how happy he is doing touch-up paint with his gross, dirty cast hand! The bike is built and complete now, so you'll be seeing it in the next couple days...! Our friend and wrench Andrew is great. He's got an awesome Stevie Smith mustache, he drives a cool truck, and he can lift heavy stuff. So of course Andrew has a sweet bike. A few sweet bikes, in fact, but his Kawasaki Green Evil the Following v1 is pretty damn rad. Andrew built it up to his liking - Shimano drivetrain, Hope brakes, salvageable bits from his beloved Stumpy. It's key to be remind yourself how important dinging your bell at foot folk is by checking your speed. Andrew is typically in the 20-25 MPH zone. Silver stickers pop on the green. Bikes are fun! They are, and you know it. Bikes rule because they're fun, and we like having fun. Which is why we're stoked to have partnered up with Squid and are now ready to sling their awesome, fun DIYFS bikes! The first one arrived the other day in a spraypainted box, ready to shred. Well, ready to paint. We get to ready it for the shreddy. "Riding bikes is about as dumb and futile an endeavor as many other hobbies, which is to say it's worthwhile and existentially gratifying in ways that are hard to explain. Bikes are simple machines that bring deep joy. They're a way to find clarity and peace, not to mention a great way to get around." Squid makes this cross bike (the $quidcross), a hardtail ripper, a steel cross bike, and a BMX cruiser. They all ship stock as raw frames. The aluminum ones are welded by Ventana. When they arrive, you can paint them yourself, or we can do it for you for a fee. Squid's artists will also paint one if you ask nicely enough (pay). These bikes RIP and they're cool. Be the only one in the MFG with a PDJ-painted $quidcross! Our new best friend Melissa came in looking for an Evil demo. She wanted to ride family laps at Paradise, shred the Stevens lifts, and venture into the great white north now and again. The Wreckoning was on her wradar (hah) already, and riding one at her local haunts confirmed the suspicion. 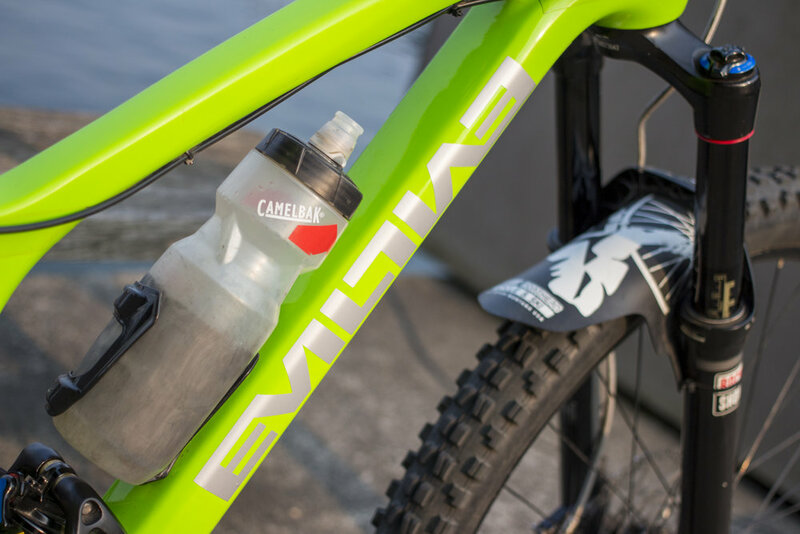 The LB Wrecknoing gets a bottle mount, better (lighter, stiffer, springier!) carbon layup, and two great new colors. The bronze-brown matte finish reminds some people of root beer, and other people of... other things... but it comes stock with a black sticker kit and grips. Resident style master Riley picked out the gold sticker kit, orange Burgtec stem, and Melissa recommended the matching Evil Palmela Handerson grips. It is stupid good. A couple swipes of heat shrink finish the job off cleanly. When Peter came to us to find a replacement for his ti Lemond, we knew it had to be an RLT. 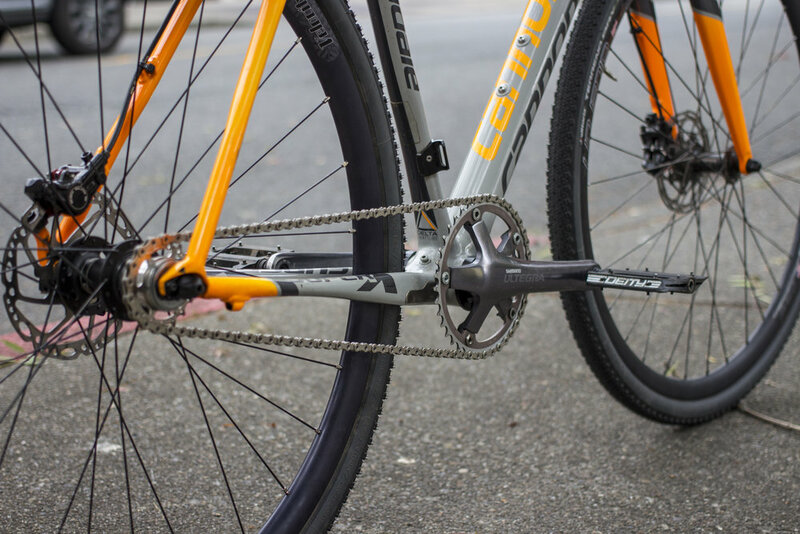 And when he said he wanted his bike to be able to do all the rides he wanted to and also make zippy zappy robot derailleur noises, we priced out a couple options, but it always had to be eTap HRD. The ease of use, liveability, and performance are unmatched, and it's not significantly more expensive than a Di2 kit. Not to mention that it just looks clean. It makes us dream of the days when we have wireless electronic brakes (dreams from which we wake up screaming when we reach the part where we've just turned around at the Hurricane Ridge visitor station to find we forgot to charge up the night before). It's really easy to spec out a bike with all the go-fast "look at me!" carbon bits you can find—that takes a deep wallet and the ability to discern which number is the least. And those bikes are cool, but not as cool as a classy and tasteful build with solid, reliable, and (more) beautiful aluminum bits. The eTap does make people pay attention, though. We've gushed over these wheels a lot lately, but they really are amazing when paired with a supple tire like these Barlow Passes. They really let the tire do its job and they're fantastic. These days, as you can tell, we look first to Eugene, Oregon for wheels. Rolf/Astral are making aluminum rims in-house, getting White Industries hubs, and building them by hand to order. Every set comes with a card with your builder's name. So when Mitch walked in with this beautiful LeMond Buenos Aires and a pair of dangerous Bontrager wheels, we knew exactly what was needed. A 1370g wheelset that's stiff enough to let a Vittoria Corsa shine in all its suppleness. And we were all pretty jazzed on how they look, too.